ELA’s Advanced Theatre Class presents Aladdin! 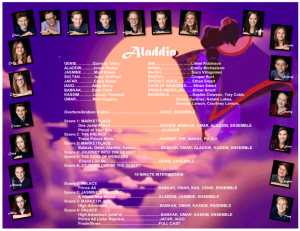 Come see 20 amazing students in this Disney classic! Tickets: Tickets are now on sale! They are $8/each. Just click “Buy Tickets” at the top of this page! Ticket Policy: There are no refunds. No one under 3 may enter the theatre. You can exchange with 48 notice and $2/ticket. Everyone entering the theatre must have a ticket (no lap sitting).